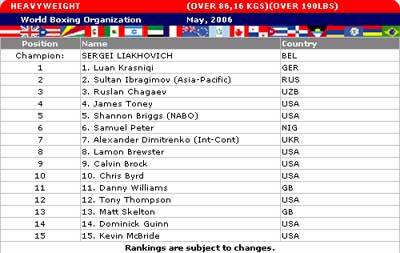 As expected, Wladimir Klitschko has been removed from #1 position with WBO rankings due to him becoming a champion in the IBF version where last month he dethroned former champion Chris Byrd by TKO. Thus, Luan has now moved to position #1 and despite many that think he could not deserve a championship title so soon, he is likely this summer to be designated as the mandatory challenger. We have to wait and see. We should not forget that Luan was very close to winning the fight with Brewster last September, and today he could have been a defending world champion. Brewster was getting beaten until that crucial round 8 when Brewster landed a powerful punch which derailed Luan's hopes to become a champion. From what I gather while talking to other fans, for which I totally agree, Luan made a crucial mistake in round 9 by quitting cc.10 seconds before the end of the round. That this was probably the biggest mistake of his career it become apparent when Lamon had to be held by three people as he could not make it to his corner on his own feet. This gives us a lot to think about what could have happened, had Luan not quit and did continue the fight on round 10! Luan looked much fresher after round 9 and I would not have been surprised at all, had he continued the fight, to have seen Lamon on the floor. But hey, it happened the way it did and it does now remain on Luan to really prove himself he is not a quitter, hopefully in the fight with Liahkovich. And since Liahkovich proved better than Brewster, beating Liahkovich would symbolically settle scores with Brewster. Nevertheless, this is going to be a cruicial year in Luan's professional fighting career. i find your site very wonderfull and complete. Thank you for all the information about Luan.